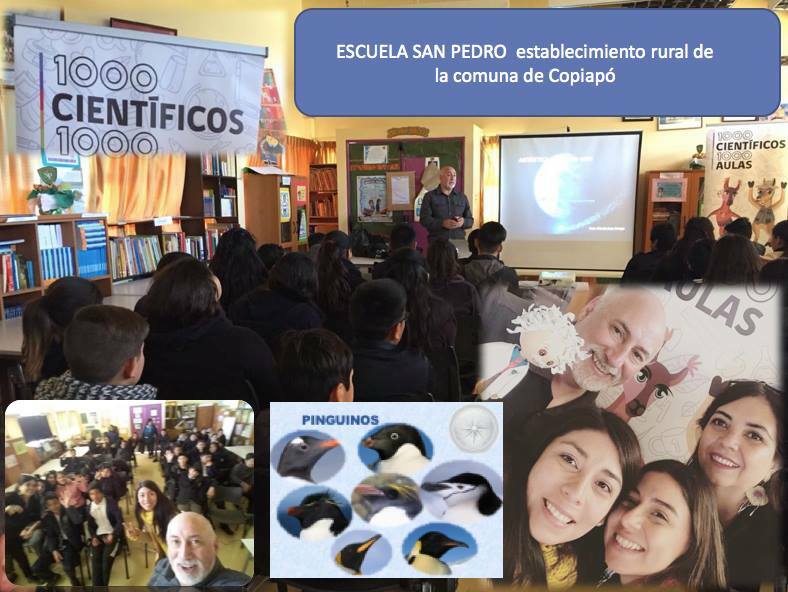 PEI Member, Professor Alfredo Soto, Coordinator and professor of the area of ​​Outreach at GAIA Antarctic Research Center (CIGA), visited schools in the districts of Copiapó, Caldera and Tierra Amarilla, directly supported by personnel from PAR Explora Atacama, (University de Atacama), within the program “1000 scientists … 1000 classrooms”. Professor Soto presented his talk “Antarctica: Land Without Bears”, whose format reaches students of all ages. The Explora Conicyt platform visited the “Luis Cruz Martínez” School, the “Isabel Peña Morales” School and the “ALMENAR” private school in Copiapó; the schools “Byron Gigoux James” and “Villa Las Playas” in the city of Caldera; the school “San Pedro” in the hacienda of the same name, and the School “Víctor Sánchez Cabaña” in the commune of Tierra Amarilla. In this same tour it was possible to consolidate the purpose of the School “Víctor Sánchez Cabaña” of wanting to acquire the “Antarctic seal” granted by the Umag for educational establishments. For this case, there was a training for the teachers of the establishment, a massive and marathon exhibition for the students and participation in the School Council. In total there were around 500 students who participated in this Antarctic roaming, “marking a milestone, because it is the first time these issues are developed in schools in Northern Chile,” the teacher concluded. The University of Magallanes is not only an Antarctic academic benchmark for the region, but also achieves national and international recognition. Within the objectives proposed by the GAIA Antarctic Research Center (CIGA), it has developed in the last months varied experiences of publication of the Antarctic task at educational level.